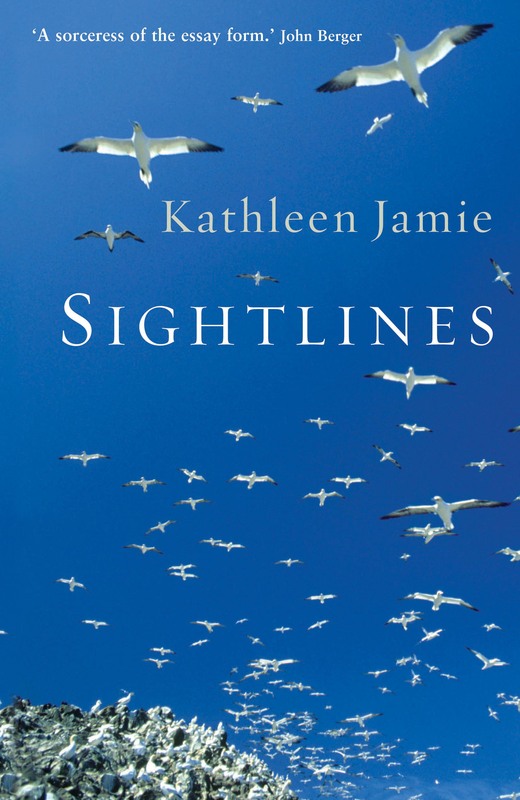 KATHLEEN JAMIE doesn’t consider ‘Sightlines’ to be a travel book, so she was both flattered and puzzled when it was named joint winner of the 2013 Dolman Travel Book Award. It’s a collection of essays inquiring into the meaning of nature; one in which she ranges from guano-spattered islands to a hospital pathology lab. In this excerpt, following the death of her mother, she asks a friend to explain to her how nature ‘takes its course’. The computer screen in Professor Carey’s office was showing a substantial portion of a liver, with the gall bladder attached. The pictures had been taken after the liver was excised, but before cut-up. The severed edge, about three inches tall, had been cauterised and so was blackened slightly. Tiny threads hung down, where arteries had been tied off. They reminded me of climbers’ gear, abandoned on a rockface. It had been removed, like the colon, because of a tumour – a big one. The tumour bulged out of the liver like a gloved fist. He meant seasick, not squeamish. 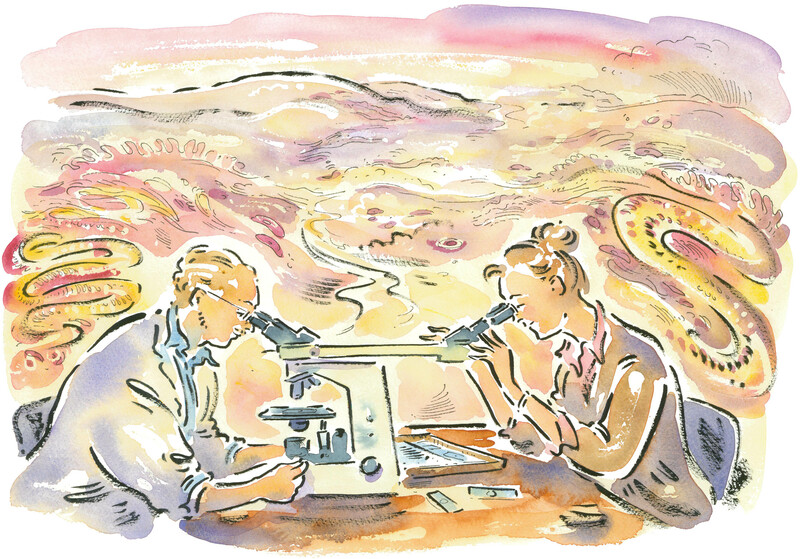 The microscope was a double-headed one which allowed us both to see the same slide, and for one unused to microscopes it was like slipping into a dream. I was admitted to another world, where everything was pink. I was looking down from a great height upon a pink countryside, a landscape. There was an estuary, with a north bank and a south. In the estuary were wing-shaped river islands or sandbanks, as if it was low tide. It was astonishing, a map of the familiar; it was our local river, as seen by a hawk. As though on a magic carpet, we flew to the south side of the estuary, and there Frank showed me how the arrangement of cells was ordered and calm. The sample had been stained with haematoxylin and eosin; organic, commonly used stains which show the nuclei and cytoplasm respectively. Frank could distinguish blues and purples; to my eye all was shades of pink, though I have a poor sense of colour. But it was a bright and pretty bird’s-eye view of an ordered, if unusual land. I saw trails of nuclei, and the cells’ supporting framework of reticulin. I could fancy the reticulin was old field dykes, the marks of a long inhabitation of the land. Here the cells were doing as nature intended, unconsciously getting on with tasks quotidian and wondrous: the filtering and clearing and storing and production. Then we were swinging north, crossing the river, which was a vein rising into the liver from the intestine. On the river’s north bank, we stopped and hovered over a different kind of place, densely packed, hugger-mugger, all dark dots that seemed too busy for comfort. Frank didn’t have to tell me this was the tumour. Although it was also still, and fixed and a pretty colour, there was an unchancy, frenetic feel to it. There were too many nuclei crammed together and, as Frank pointed out, the ‘architecture’ was improper, the cells’ structures and shapes were slewed, the supporting framework absent. We swooped low, till we were above a feature that crooked from the shore into the river, a bit like a jetty. When the magnification increased, you could see this was also crowded, and made of the same dense tumour tissue. ‘And there is also this.’ Now he focused on one of those areas I’d so delightedly thought of as sandbanks, with their old, suddenly apposite Scots names: the Reckit Lady, the Shair as Daith. There, too, we looked down on the same kind of tissue. It all seemed like bad news but I leaned back into the microscope, to be guided by Frank’s trained eye. In the healthy liver, he led me to two tiny dots and increased the magnification. The dots expanded into a double image, what looked like a pair of boxing hares. Again we travelled north, over to the tumour, and within its mass Frank found what he wanted at once. It was another dividing cell, but if they were two boxing hares, one hare was hugely bigger than the other, claiming strength and advantage. His report would call them ‘abnormal mitotic figures’ – cells dividing wrongly, and too many, and too fast. I sat back and rubbed my eyes. ‘So that’s that?’ I asked bleakly, meaning, ‘That’s going to kill him?’ The little hook out into the vein, the intimate, crowded island, a mere smear on a glass slide. As Frank put the slides away on a tray in their proper order I glanced about his office, resting my eyes. A couple of lab coats on a peg, books and files on a shelf, pathology textbooks, a child’s drawing, a bicycle helmet, the window screened by a pale blind. ‘Flying’ may have been an illusion, but it was one my body believed, because I was feeling queasy, with all this swooping down and up. Queasy, but cheered. This time the country beneath was a gorgeous sapphire blue. It had a north-facing shoreline and, a mile or so inland, so to speak, were regularly spaced ovals, end-on to the coast, that might be craters, or even sports stadiums. Frank was describing it to me with his customary quiet level-headedness. He was speaking of ‘columnar structures’ but it look me a while to understand that he meant the ovals; they were sections cut horizontally through columns. These were acid-producing glands; we were in the lining of someone’s stomach. Between the oval structures were valleys, if you like, fanning down to the shore. Frank wanted to show me something in one of these valleys and I couldn’t find it at first; it took several patient attempts – this microscope didn’t have a cursor device to point at things. It was a very human moment, a collusion of landscape and language when one person tries to guide the other’s gaze across a vista. What vistas I’d seen. River deltas and marshes, peninsulas and atolls. The unseen landscapes within. You might imagine you were privy to the secret of the universe, some mystical union between body and earth, but I dare say it’s to do with our eyes. Hunter-gatherers that we are, adapted to look out over savannahs, into valleys from hillsides. Scale up the absurdly small until it looks like landscape, then we can do business. I had it: six or seven very dark oval dots, still tiny, despite the magnification, were ranged across the blue valley, like musk oxen on tundra, seen from far above. ‘Grazing’ was the word. Although the landscape was bright blue – a stain called Giemsa – it was an image you might find in a Sunday-night wildlife documentary. Pastoral, but wild, too. So close to home, but people had landed on the moon before these things were discovered, free in the wilderness of our stomachs. ‘No purpose. They’re not conscious. They just are. These things have been co-evolving with us, for millennia and millennia. They’ve adapted to live in acid. There are some people, you know, who take the stomach as evidence of ‘intelligent design’, because it contains its own acid; you walk around with a bag of acid in you, and come to no harm. But it’s evolved that way, and these things have evolved with it. Of course I did. More little journeys to strange new shores. The nature within. Nature we’d rather do without. If I were a pathologist, I think I ought always to have that woman in the room, the one who kept saying, ‘Aw, what a shame’, a one-woman Greek chorus; otherwise I fear I’d be seduced by the bright lights and jewel colours, the topography, flora and fauna, so caught up among the remote and neutral causes I’d forget the effects. Again Frank swapped slides, and again the world was pink. We were in the small intestine and this time I had no trouble seeing the beast in question; it was cruising along the indentations of a coastline like a gunship. A pink triangular balloon, with a thin mean tail – though microscopic, it was big enough to be thuggish, and I said so. Pestilence and disease. It’s pretty grim. Who wants the privacy of their body invaded and bits cut out and chopped up and the remnants scraped into a polythene bag? But we’ll go a long way not to die. Who wants their neighbour down the street or round the world to bleed into her stomach when a course of antibiotics will do the trick? We need disease to dance us on our way; we need to halt it if we’re to live morally. Twin truths, like boxing hares. I drove home along the river I’d fancied I’d seen in the poor man’s liver cells. The tide was in, no sandbanks. The inner body, plumbing and landscapes and bacteria. The outer world also had flown open like a door, and I wondered as I drove, and I wonder still, what is it that we’re just not seeing? Kathleen Jamie is a poet and essayist and a teacher of creative writing at the University of Stirling. Her poetry collections include Jizzen (Picador), Mr and Mrs Scotland Are Dead (Bloodaxe), The Tree House (Picador) and The Overhaul, winner of the 2012 Costa Poetry Award. Besides Sightlines, she has published two other works of non-fiction: Among Muslims and Findings (Sort Of Books).